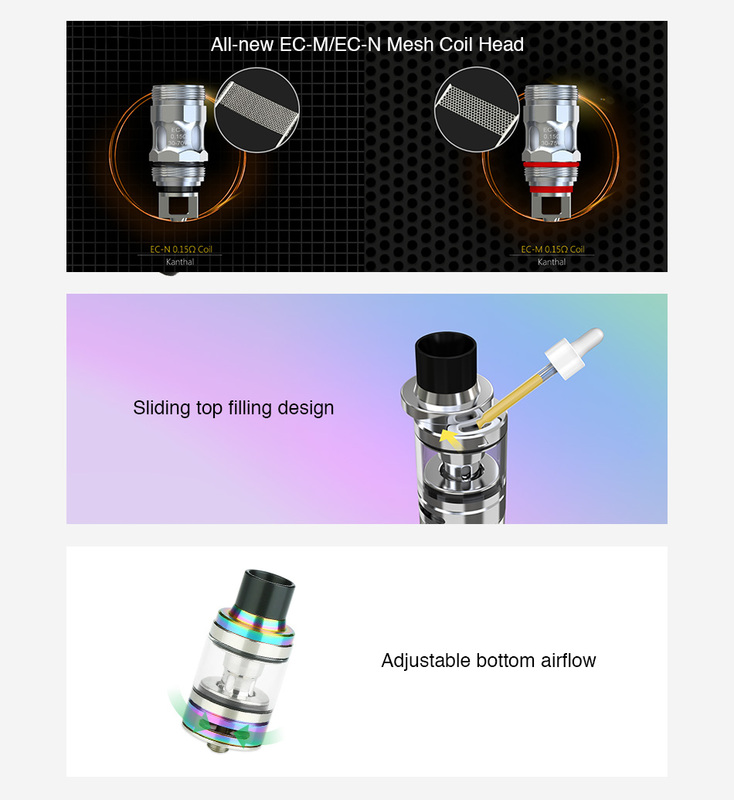 With 4ml/2ml e-juice capacity, the Eleaf iJust ECM Atomizer is a new innovative mesh tank with the unique EC-M and EC-N mesh coils. Compatible with the iJust ECM battery, the iJust ECM is a great device for vapers! Perfectly compatible with iJust ECM battery, the Eleaf iJust ECM Atomizer is a 4ml/2ml innovative mesh tank for simple yet excellent vaping. The iJust ECM Atomizer comes with all-new EC-M and EC-N mesh coils made of advanced steel material and organic cotton with unique structure to bring optimal flavor and huge cloud. With the sliding top filling design, the iJust ECM is easy to fill without leakage. Plus the adjustable bottom airflow control, the Eleaf iJust ECM Atomizer is definitely an excellent atomizer. Just get it now! Empty atomizer. You can select the e-juice. Perfectly compatible with iJust ECM battery. The iJust ECM Kit/EC Coils is also available.